Yagodina village (1100 m altitude) is located in a valley between two peaks that rise 500 meters above the village. Durdaga peak divided by Trigrad Jagodina and is heavily forested, south of the country grows the famous tea Sideritis. Elijah peak is the exact opposite of his brother with a stony slopes. It is located on the north side of the village and stops the cold wind, creating a unique climate for the village. 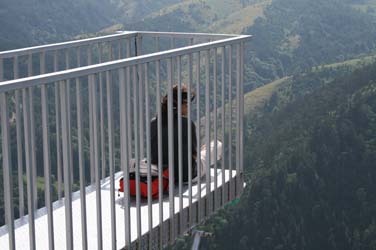 The view which opens from the top of Elijah gave rise to the enterprising people of the village to build a metal platform that sticks out to 4 feet above Buinovsko Gorge. The design was created with the thought of safety first. Tourists visiting the site can feel completely relaxed, and so to enjoy this tale called Rhodope Mountains. West view extends all the way to Rila and Pirin, even if it boasts a good vision, your gaze to the north can get down to the Balkan Mountains. As you look down from the ramp opens Buinovsko gorge with the river meandering alongside the road. It is not a rare sight to see a golden eagle overflying a chamois cloth are tied to your lens. Kamenik house is located in the village and is an ideal starting point for day hikes to Eagle Eye. Explore the picture gallery and see for yourself how many more there to see. Yagodina village looks forward to reveal a long kept secret in front of you. Welcome!